This recipe is quick and easy to prepare. It then cooks slowly to create a meltingly tender casserole. Preheat the oven to 150°C, gas mark 2. Heat 1 tbsp of the oil in a large ovenproof and flameproof casserole dish with a lid. Add the beef in 2-3 batches and cook each for 2-3 minutes, until lightly browned. Transfer all the meat to a plate and set aside. Heat the remaining oil in the casserole dish and add the onions. Sauté over a low heat for 6-7 minutes or until beginning to soften. Add the sugar, flour and balsamic vinegar and stir over a high heat for 2-3 minutes. Pour the ale over the onions and stir until it reaches boiling point. 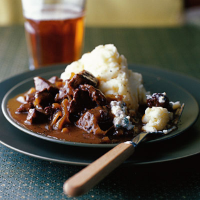 Return the beef to the casserole and season lightly. Cover and cook in the oven for 1 1/2 - 2 hours, or until the meat is very tender and the cooking liquid has reduced to a syrupy consistency. Mix the creamed horseradish and thyme leaves together and serve as an accompaniment to the casserole with creamy mashed potato. Make this a day ahead if possible, to allow the flavours to develop. It can be frozen for up to 3 months in an airtight container. Thaw overnight in the fridge and reheat on the hob or in the oven until piping hot.